DAUSA is fortunate to enlist the support of a versatile singer/actress and radio/TV personality, AMAPOLA, in introducing to young Fil-Am Danawanons classic Cebuano love songs through www.dausa.org in line with DAUSA’s mission to instill in the minds and hearts of our new generation an appreciation of our rich Cebuano heritage. Amapola is the daughter of the late great Cebuano musician, Mahnee Cabase, an icon in Cebu radio for over two decades, best known for his harana. She graciously volunteered to share with Cebuanos through the DAUSA Website her father’s huge collection of Cebuano composition. Younger Cebuanos vaguely heard of this very popular Cebuano celebrity who sometime in the 70s quietly slipped out of the country at the time her popularity was rising to superstardom to find her niche in the U.S. So, I am posting Amapola’s brief bio penned by an adoring fan, Marie F. Hernandez. 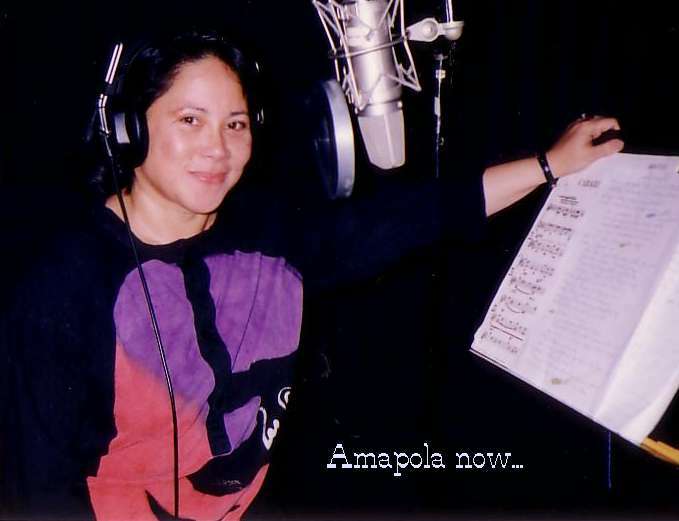 Born in Cebu City to Manny & Sheila Cabase, Amapola began her musical career at the age of five, singing her father’s compositions & her mother’s lyrics in Visayan movie productions subsequently featured in a few films as a child star. Her career blossomed & took her to Manila where her television, stage, recording & film endeavors flourished. At age 17she was dubbed the ‘Jukebox Queen’ (because Jukeboxes were filled with her hit singles) in the Philippines, she sought more challenges & went on concert tours in Asia & the Pacific, and eventually the US Mainland – juggling appearances at The Fairmont Hotels in San Francisco and Dallas & in her own Magazine TV-Variety show “Amapola Presents Show” in San Francisco’s Channel 20, KEMO-TV for eight years. Scaling the heights of her musical career took her around the world – inland on concert tours and at sea as headliner onboard some of the world’s most luxurious ships. Soon she and her group was invited by showbiz agent “Fae” Corrales to appear as guests on “An Evening with Pilita” that opened many doors for Amapola and her band. She then resumed her film career in the lead role as the ill-fated ladylove of matinee idol Victor Wood in the film “Mr. Lonely”. Added to her movie shoots were appearances with her co-stars: Eddie Mesa, Carina Afable, Tirso Cruz III, Ike Lozada, and many more stars in the TV musical variety program on ABS-CBN: Stop Look and Listen. In addition to her full television schedule, Amapola reigned as the resident chanteuse at the famous Hotel Intercontinental in Makati, Metro Manila with Ramonito del Rosario, Art Maloy, Maning Aballe, and the Manny Cabase Band. True to the saying: “when it rains it pours”, Amapola was offered another lead role opposite Victor Wood. Amapola tackled the role with aplomb, as a provincial lass fighting to keep the love of her life (Victor Wood) from the other woman. “You Are My Destiny” opened to jam-packed movie theatres all across the country on Valentines day which earned Victor Wood and Amapola the title: Love Team of the Year. Amapola continued appearing on television variety shows and performing in El Castellano and Le Boulevardier in Hotel Intercontinental until an offer for a Hawaiian concert tour was offered to her in 1972. It was the same year that she had 3 singles listed in the top ten charts from her album: “Songs and Amapola.” She starred in the Hawaiian tour that reunited her with some of her colleagues from her ABS-CBN television programs: Boy Mondragon, Linda Magno and Diomedes Maturan. (Later, Amapola embarked on her solo performances at the Kahala Hilton in Honolulu and then co-starred with the Hawaiian icons: Danny Kaleikini and Don Ho in a benefit concert tour around the islands. After her Hawaiian concerts & nightclub appearances, Amapola toured mainland USA for a couple of years. She then accepted an unprecedented contract at the Mabuhay Gardens (later nicknamed the FabMab) from owner-proprietor Ness Aquino, who later became her co-host in her syndicated television magazine-variety: “Amapola Presents Show” produced and directed Punk Godfather Dirk Dirksen. “Amapola Presents Show” went on for 8 seasons alongside her nightly appearances at the Fairmont Hotel’s Tonga Room from 1976 to 1982, making Amapola the longest running local solo performer onstage and on television in the Bay Area, and the only singer who sang the anthems for the Giants, 49ners and the Oakland As all in one season.